Cleaning the oven is a laborious and time-consuming chore that most homeowners hate to do. Seriously, who wants to spend their well-earned weekend off with their head stuck in the oven breathing in fumes and scratching grease? We use ovens every day and they have to be cleaned regularly however much we hate doing it. You can postpone major oven cleaning by getting rid of minor spillages and grease. Nevertheless, every once in a while or at least regularly you should clean the oven intensively. Just thinking about cleaning the oven is wearisome. Having the experts handle this tiresome and backbreaking task has numerous advantages. Let us consider a few reasons why you should let a professional cleaning company clean your oven. Properly cleaning your oven sometimes means dismantling it into pieces. If you haven’t figured out how you are going to pull off the oven doors and clean it in your sink then you should probably not even get started. However, you don’t have to worry about a thing because when you hire cleaning experts they will not only do the cleaning they will handle the mechanics as well. They will do all the dismantling of doors and fans without any problems enabling them to provide your oven with a rigorous clean. This is not your typical DIY job because you could damage your oven. We all have very busy lifestyles and cleaning the oven is not your average five minutes task, it could actually last half the day. Therefore, if cleaning the oven is not very high on your list of priorities, then you should save time for more valuable work by hiring a cleaning expert. Not only will the cleaning professionals do a better job they will save you a lot of time and as they say time is money! Remember a clean oven is more efficient because it evenly distributes heat much quicker saving time. As mentioned earlier, a clean oven is much more efficient and saves a lot of time. Nonetheless, you get to save money as well because meals will take a shorter time to cook since the heat is sufficiently distributed leading to greater energy savings. Plus, you can actually see through the clean oven door glass to watch how the food is cooking without opening the oven. This will minimize heat loss that causes reheating as a result of opening the oven door frequently. Cleaning your oven also makes it more durable saving you money in repair or replacement. A dirty oven is a recipe for disaster, because as dirt and grease build up around the fan and shelves your oven becomes vulnerable to fire. It is also a health risk because your oven can be a safe haven for bacteria to grow and make your food unhealthy for consumption. 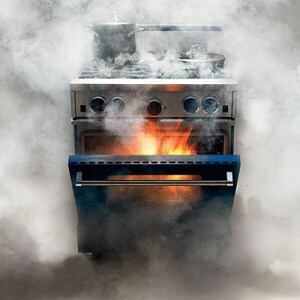 Therefore, a thorough cleaning of your oven by experts will save you from a fire disaster and illness. A dirty oven will make the food prepared by the best chef taste average. Food prepared in a dirty oven will taste different because the heat is not evenly distributed and additionally the dirt and grease can evaporate and spill into your food. Therefore, it makes sense to have a clean oven if you want quality food. In a nutshell, cleaning your oven has numerous benefits and letting the experts clean your oven does not in any way imply that you are lazy. Therefore, there is no shame in calling an expert cleaning service to clean your oven and no one should make you feel guilty about it. We all have very busy schedules and some tasks are better handled by experts. Check out all the services we offer. If you want to attempt cleaning your oven on your own check out this YouTube tutorial.